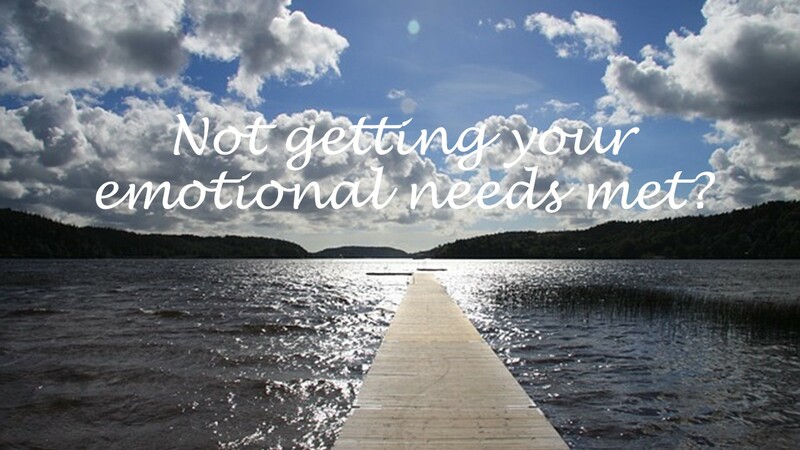 Not getting your emotional needs met? What if you haven’t been getting your needs met? If you have been thinking that you have needs that are not being met, you need to be the one to take the steps to get those needs met. Too often people sit back waiting, expecting someone else to realize what is needed and meet those needs. If you’re old enough to be reading this yourself, you have reached the age where you have to take responsibility for your own needs. It would be wonderful if other people could know your needs, read your mind, and do the things you need for them to do. Unfortunately, mind reading is a skill most people do not have. Effectively getting your needs met is a skill that you can develop. Below are some ways that you might develop the skills to more successfully get your needs met. Identifying the needs that you have. One significant reason you may be unable to get your needs met is that you may be unclear about what those needs are. Think about those things that you would like more of in your life. Other things you may want less of in your life. What specifically will you need in order to feel that your needs have been met? It can help to write out these lists. Sometimes you will have a very specific list of things you need. You may need a ride going somewhere, you may need help with shopping, or it may be an emotional need that you want to meet. Some needs are easier to identify than others. On occasion, you may not be clear what your needs are. You may simply feel uneasy, anxious or discouraged. Spend some time thinking about what these needs are. It may help to discuss your unmet needs with a friend or supporter. Be careful not to insist that this friend or supporter must be the one to meet that need. Once you’ve identified specifically what the need is which must be met, you can move on to the next part of the process. Can you meet this need yourself? It’s likely that some of the needs you have, you will be able to meet yourself or you can learn to meet this need. Work on identifying specifically how you could go about meeting your need rather than being dependent on others. You may have to develop a written plan to help you in the process of learning to meet your own needs. Begin by identifying the things you need which you can learn to do yourself. But what if you can’t meet this need yourself? Who should you ask to get these needs met? The next step in the process of learning to get needs met involves identifying who might be able to do that for you. Maybe your need involves a problem with a business or government agency that you are dealing with. You may need to talk to a specific person in order to get that problem solved. Be sure that you are talking to the person who might be able to help you with this issue. Sometimes a crisis crops up. Say your car isn’t working and you need to get work. Who could help you with this? You may need to call some friends who have cars and might be able to give you a ride. Other times you might need to find the bus schedule and how much time it would take to get there on the bus. In some situations, the person who could meet this need may be a taxi or other paid ride service. Persistence pays off, keep asking. Some of the people who you will need help from in order to meet these needs may have many other things to do. You may need to ask for what you want more than once. Sometimes you have to remind people. Other times you may need to be persistent enough that you become a priority in their daily schedule. Think about using this process to do a better job of meeting your life needs. First get clear on what you need. Secondly, decide whether this is something you can do yourself. Then if this requires someone else to help you meet that need, identify who that person might be. Lastly be persistent, keep asking in a polite way. Try using this process and see if you are not able to improve the number of your needs that are getting met. This entry was posted in Self help skills and tagged assertiveness, Getting your needs met, persistence, self care by David Joel Miller. Bookmark the permalink.